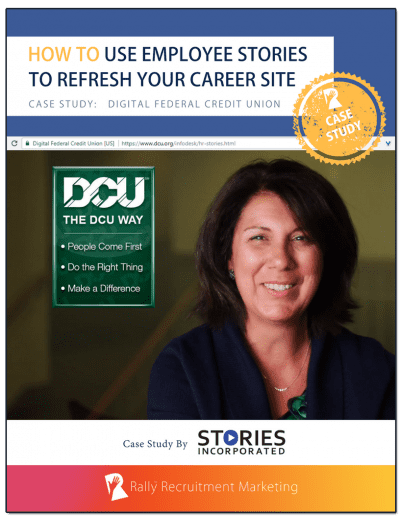 Learn how Digital Federal Credit Union (DCU) refreshed its career site with employee stories in 10 weeks, without needing to change its front-end design or back-end technology. DCU partnered with Stories Incorporated to interview employees to uncover what it means to work at DCU so that it could better attract candidates who fit the credit union’s culture and values. After the career site refresh, 40% of hiring managers said their recent hires raised the bar in team quality. Stories Incorporated is a sponsor of Rally. Their sponsorship fee helps us to provide educational content and events on Recruitment Marketing.